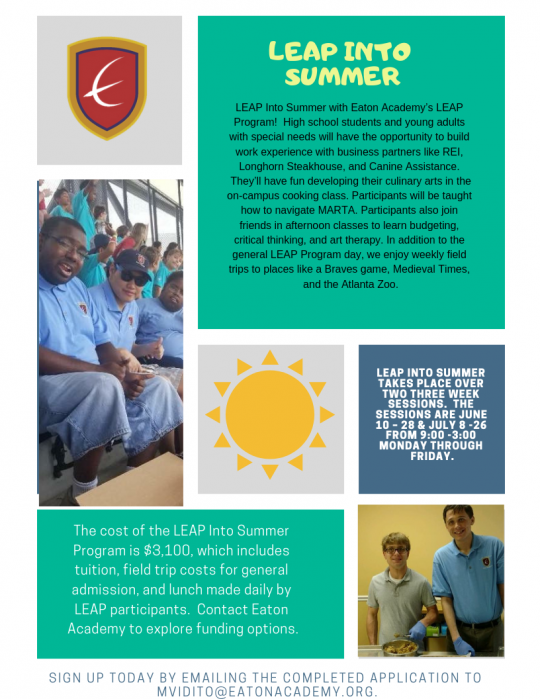 The Eaton Academy Summer School program is designed to help individual students take the high school courses they need for graduation. Students have the opportunity to make-up courses or to accelerate their scholastic pace by taking new courses. Classes run from 9:00 a.m. to 1:00 p.m. Monday through Friday. Students must attend every hour of each session, complete all assignments, and pass the course to receive credit. There are two Summer School sessions, each running three consecutive weeks. K8 students also enroll in Summer School to facilitate academic growth and skills in specific areas. These programs are accredited by AdvancED and the Georgia Accrediting Commission (GAC). Additionally, courses are available online. This approach enables students to complete their summer course work virtually anytime, anywhere. Students can arrange for live teacher-support via the Internet for an additional fee. For more information about our summer school offering, call or e-mail Margie Cohan. English, Mathematics, Science, and Social Studies. Small group classes operate Monday through Friday, 9:00 a.m. to 1:00 p.m., for three consecutive weeks. Independent Study courses and tutoring are scheduled individually. To register and for payment information, click here.